Good question. Foster parents should be able to make a commitment to spend time with the foster dog and give them all the training, exercise, love, and attention the dog needs — however long it stays with them. Sometimes these dogs need special care and that takes time and effort. And then you must be able to say good bye when we find them their own forever family. But know there is great joy in that when the day comes. One thing of which you need to be fully aware is that fostering is not the “fast track” to adoption. If you foster a dog with the intention of by-passing our standard adoption process, you will find that this is not permissible except in rare instances as deemed appropriate by area coordinators. Foster homes must go through the same process as our adopters and meet the same criteria. As much time you can spend with the dog. In some cases, the more quality time you spend with your foster, the more quickly you can prepare it for placement in its forever home. Be prepared though for the first week or two to require more time while they get used to their new environment. 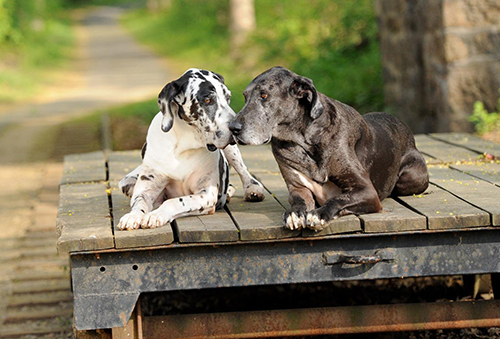 Some dogs acclimate quickly to new environments but others are more stressed and traumatized and require more care. Unfortunately MAGDRL does not have facilities to temporarily house foster dogs. As a result, foster caregivers often develop support systems to provide care in their absence or they stagger the times when they foster. Some schedule vacations between orphans or find pet sitters or family members to step in when they travel for business. The same provisions that you would make for your own dog would apply to a foster — with the caveat that if you do plan on boarding your foster Dane please be sure to discuss this with your area coordinator before hand and be sure they have all contact information for the kennel and the kennel has their contact information. Lack of funds shouldn’t prevent you from fostering, but you will have some expenses: good quality dog food, and any toys you wish to provide. Although necessary veterinary expenses, including heartworm preventative, are paid by MAGDRL, remember that we are a nonprofit organization so anything you donate to your orphan’s care can be deducted from your taxes. Your MAGDRL Coordinator will work with you to select an appropriate dog. The foster application allows you to specify requirements, such as a foster must get along with your dogs, cats, or kids. As a foster, once you take a dog into your home we expect that you will work through any problems that arise unless they are severe. Should such a situation arise, you must immediately contact your MAGDRL Coordinator. You must also be prepared to give your coordinator 48 hours to find new placement for your foster dog. Remember, we do not have a kennel so it is very unlikely that a coordinator can remove a dog from your home immediately. 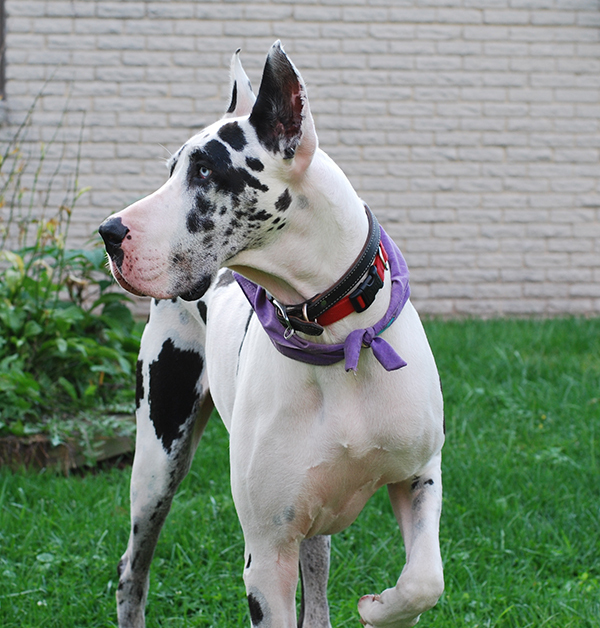 Once your family has decided together to foster a Great Dane, please contact your local MAGDRL Coordinator. If you send us your evening/weekend phone number, a volunteer will call you back to start the application process with a phone screen. If you meet our preliminary requirements, and mail us a completed Volunteer Application, someone will contact you to schedule a home visit. They will provide more detail about your responsibilities as a foster and answer any questions you may have. 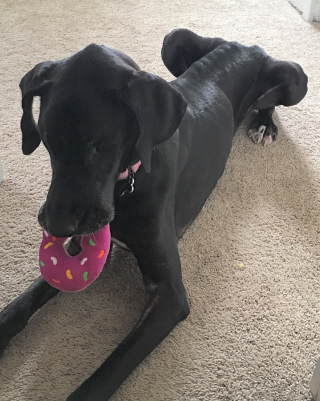 If you are approved, you’re on your way to helping to prepare a Great Dane for its forever home! 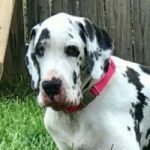 Please let us know if you can help us house an orphan Great Dane until a permanent “forever home” can be found. The first step is to email Joanne, Volunteer Team Lead, at fosters@padanerescue.com, or give us a call at (610) 983-9445.